So here it is. The 604 Anniversary Mix. A journey throughout the seasons. This series of mixes began as a simple two-part mix of Night and Day tracks that was to span the decades. After releasing the first mix, while beginning to assemble the second mix, I kind of thought that it would be more fitting to make a Four Seasons of Goa series of mixes to celebrate the anniversary of Goa. There are so many different corners to explore, I felt two mixes was squeezing things a bit tight. I had originally made the second mix so that it could play seamlessly after the first mix and then did the same for third mix. After I finished the third mix (Summer), I realized that if each mix were 91 minutes, they would Voltron into a single 6:04 length mix. Unfortunately, by this point it was too late. I was already locked into 80 minute mixes. A bit of elementary arithmetic showed that I could likely add five more tracks (one at the beginning, end, and then between each of the mixes) and make the entire thing the proper length. All together, there are 55 songs packed into these six hours and four minutes of music. From the old to the new to the unreleased to the overplayed; the journey weaves in and out of sanity and oscillates through various parallel dimensions. I touch on almost everything (from Green Nuns to Rip Van Hippy, Ticon to Kino Oko, Planet B.E.N. to Pleiadians, Blue Planet Corporation to Texas Faggott, even Infected Mushroom and GMS make appearances). Had I truly thought this out ahead of time, I may have moved a few tracks around or maybe swapped a few out for something else, but none of that matters, as this is what it is. While you could just download each of the 04 season mixes (winter, spring, summer, fall) and get most of this journey, hearing the entire thing in full is kind of the way to go. It truly winds you through so much rich history of Goa and I feel it showcases why, even though some of my friends have walked away from this music, it will always have a hold on me. 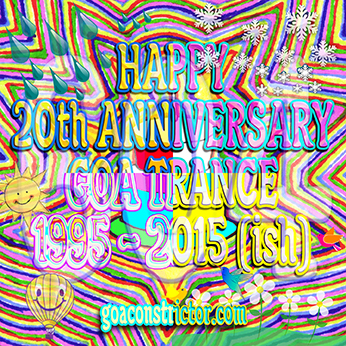 Happy 20th(ish) anniversary Goa trance!!! This entry was posted in MiXeS and tagged Bass Chakra, California Sunshine, Darshan, Disco Slickers, Doof, Earth Nation, ECT, Eiji, GMS, Green Nuns of the Revolution, Gus Till, Hallucinogen, Infected Deedrah, Infected Mushroom, Infernal Machine, Jikooha, Jon the Dentist, Juno Reactor, Katy Perry, Kino Oko, Kirna, Lucid, Manmademan, Mantrix, Max Pollyul, Montti, Nervasystem, Nervasystem & Aether, Ololiqui, Paps, Planet B.E.N., Planet BEN, Pleiadians, Prana, Prometheus Process, Psychopod, Quench, Quietman, Quirk, Rip Van Hippy, S.U.N. Project, Scozbor, Semsis, Shakta, Shiloh, Shiwa 2000, Slinky Wizard, Son Kite, Sussex, Synthetic, Terrafractyl, Texas Faggott, The Infinity Project, The Sebastians, The Spangle Factory, The Visitors, The Zap!, Ticon, Tranan, UltraTom, Vibrasphere, Wizzy Noise, X-Dream, XV Kilist by admin. Bookmark the permalink.